A friend of mine has a BIG apple tree in her garden that produces a lot of Bramley apples. I just can't resit her offer of huge bags full of such lovely, juicy and tangy fruit. So, I've been busy making apple chutney, muffins and cakes.... goodness knows pretty much everything I could think of. 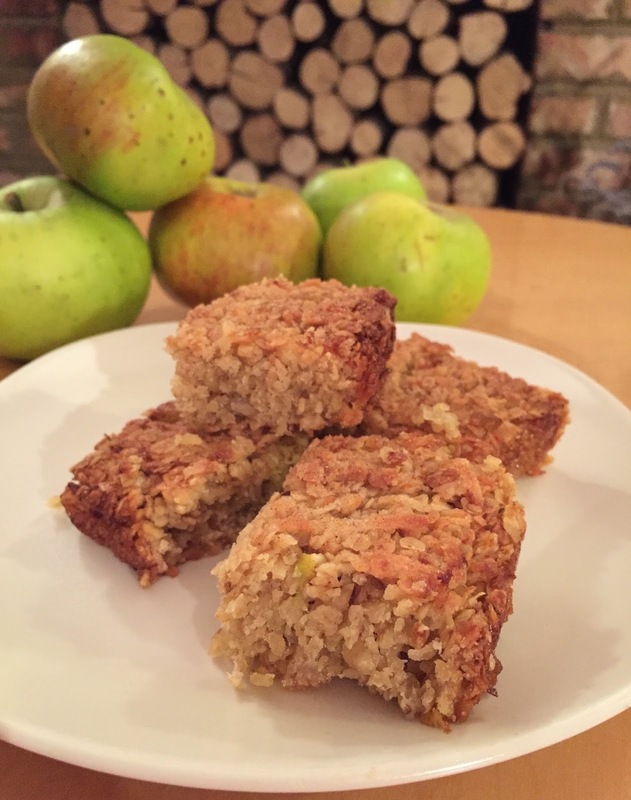 When I almost ran out of ideas for using up the apples, I came across a recipe for "Apple Flapjack" which is not "crunchy" flapjack, but is very moist. I suppose it's a different type of snack and very morish, a great afternoon treat for sure. Preheat oven to Gas Mark 4, 180°C, fan160°C. Line a 20 x 30cm (8 x 12in) cake tin with non-stick baking paper. Melt butter, caster sugar and golden syrup together in a pan, stirring until the sugar has dissolved. Remove from heat and stir in the oats and apples. Spread the mixture in the tin and sprinkle cinnamon sugar and bake for 25-30 minutes. Cut into 12-14 bars; allow to cool before turning out of the tin.